Welcome Home! This beautiful & rarely available 2BR, 2 Bath 2-level Townhouse at The Nottingham in Fairview Slopes ticks all the boxes. 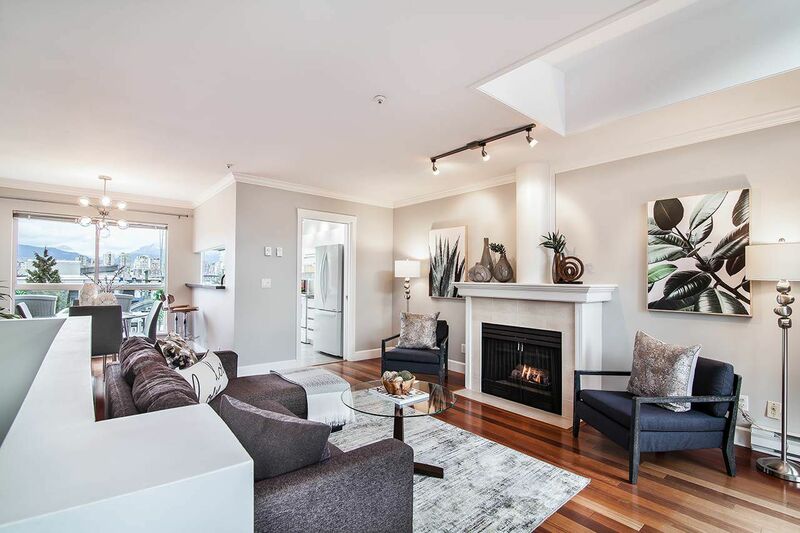 Quietly nestled overlooking the peaceful inner courtyard of this FULLY-RAINSCREENED building & drenched in natural light, this upper unit offers both north & south exposures and a smart reverse plan that saves the spectacular city/mountain views for the principal living areas. 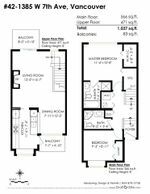 2 balconies, gas f/p, skylights, & many updates incl. newer kitch appls, Silestone counters, cherry hardwood flrs, murphy bed, custom closets, lighting & more. BONUS 2 SIDE-BY-SIDE parking + storage locker. PLUS Pets & Rentals are allowed. Great rainscreened building w/new roof (2015) & balcony replacement (2011). DON'T WAIT! !...this one is the whole package. PREVIEW OPEN THURS FEB 1, 3-4pm. OPEN SAT&SUN FEB 3 & 4, 2-4pm.